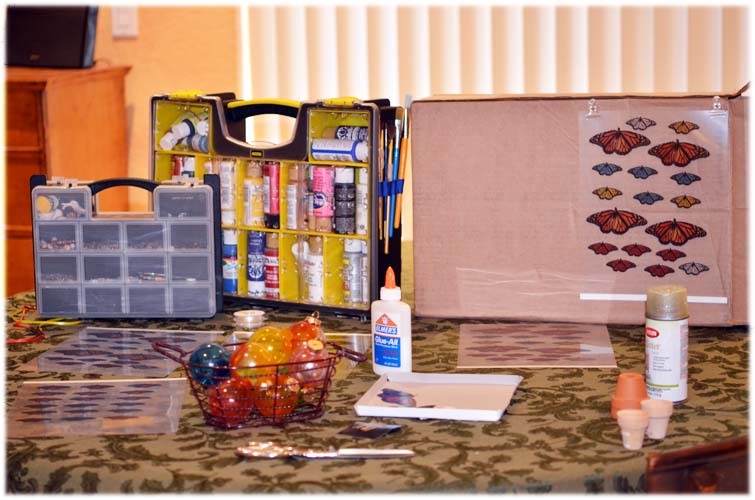 A simple project, but it requires a few things you might not have around, so you will need to get your hands on them. All of them should be readily available, however. Overhead transparency film –suitable for your inkjet printer and available at office supply stores. 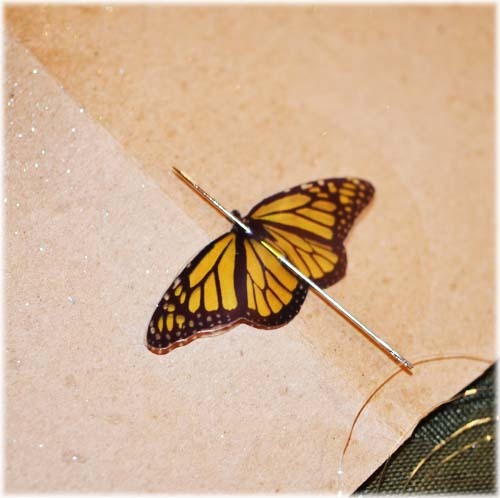 Image of a butterfly –I used a photo I took several years ago and used photoshop to remove the background so I could print a page of them and also change the colors. You can probably find some free clip art to use. If you need some help with this, post in the comment section. 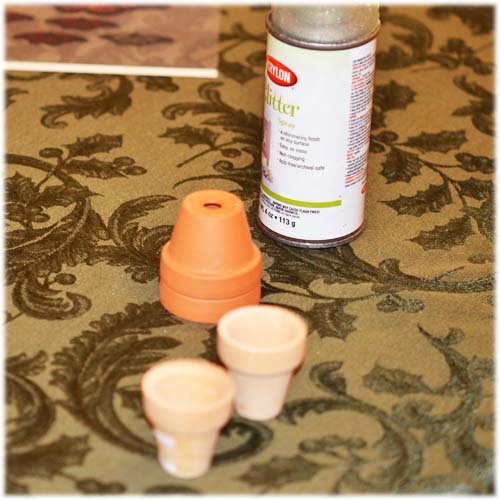 Little flower pots –I used wooden or terra cotta because I had both in my stash. Monofilament –the clear cord like you use for beading or fishing line, I used 6 lb test because it’s what I had. The first thing to do is paint the flower pot. 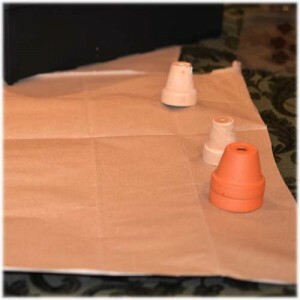 It will require time to dry between coats, so while you’re waiting for that to happen you can work on the other steps. Be sure to cover your work surface to protect it from paint, etc. I like to use throw away stuff like store bags. They are great especially the occasional paper bag. I save them all because they have so many uses. I’m sure most of you use them as well. It also makes clean up easier as I can wrap the mess up into the bag and toss it away all together. Clean up is my least favorite part. It took me 2 coats of paint to get a good coverage. I had to mix two colors to get the particular color I wanted, but that’s because I discovered the yellow I thought I had had dried up. That’s what happens when you don’t use your paint in forever! Then I sprayed glitter spray over that to get a nice effect. I sprayed until I had used up the last of the can. You can decorate it however you want, I was pretty basic because I was making several. 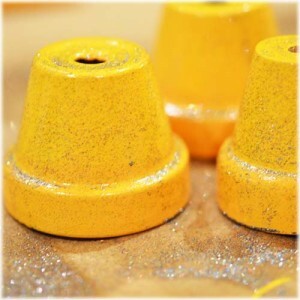 I think you could add glitter to your paint instead of the spray glitter, which is pretty messy. I just happened to have a can from some other project. I’m always trying to use things that I have stashed away. In hindsight I would have liked to use a little larger flower pot to keep the lines of butterflies separated a little better, but these were what I had. I had a difficult time thinking of things to use for that part of the project. I needed something with a hole in the top that could be suspended but stay level. If I try this project again I may come up with something different. 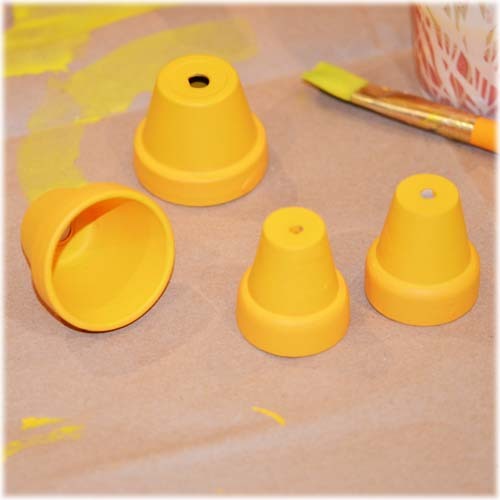 So, if you are buying flower pots, don’t get the really small wooden ones like I have in the photo. The bigger terra cotta ones are better and if you can find wooden ones a little larger all the better, I think. If you are really creative you could paint insects or flowers on the sides of the flower pots. I think lady bugs would be cute. Or maybe decorate them with ribbon or stickers. I think there are endless possibilities. While you’re waiting for the paint to dry you can print out the butterflies on the transparency film. You will need about 12. I made my first one with only smaller butterflies but decided to make the next ones with some bigger ones too. You can enlarge your image to make different sizes on the same sheet. You can make them different colors or all the same. 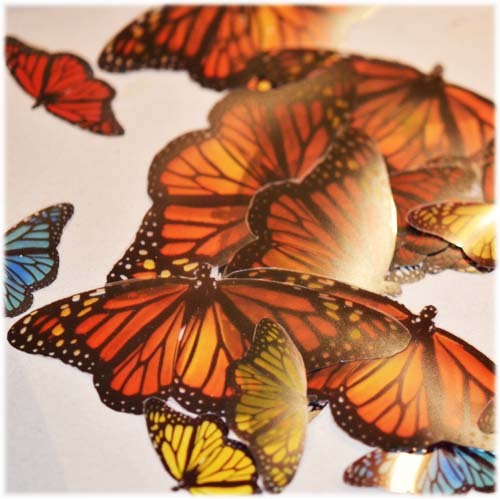 In between painting and waiting for things to dry, once you have printed out the butterflies, you will need to cut them out. The first few seem tedious, but after you get the hang of it, since they are all the same it gets easier. Be sure to trim them as closely to the colored part as possible, altho if you leave a little of the uncolored film edge on it’s not a big deal as it will hardly show. Once you get them all cut out you can admire your work. They really are pretty. I actually almost immediately thought of another craft idea (similar to something else I have done with transparency film) and then another thing that is completely different. I will be blogging both of them in the near future. These little butterflies were simply awesome! Next cut 3 lengths of monofilament about 18 or 20 inches long. You will want them not to be exactly the same length so don’t worry about being exact. Thread the needle with the first piece and put a bead or 2 or 3 on it. Using hot glue seal the end so that the first bead will not come off. Be careful not to get too much hot glue on the end as it’s difficult to clean off. Then carefully using your needle stitch into a butterfly in 2 places (see photo) and thread it onto the monofilament. 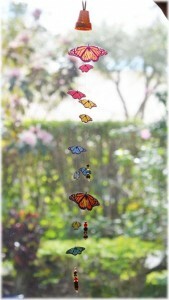 Repeat with 2 or 3 more butterflies. 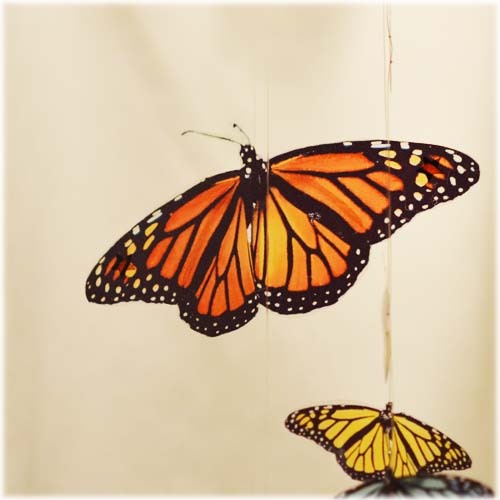 If you are using different colored butterflies try to be random with your colors so that it has a casual and haphazard look, like butterflies in a meadow. Once your flower pot is dry, take a short piece of thin ribbon, about 6 inches long, and thread it through 2 holes in the button. Tie the ends securely to make a loop. 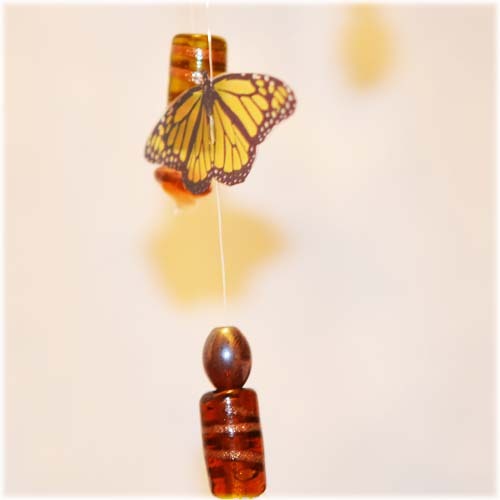 This will be the hanger for your suncatcher. Thread the loop end of the hanger through the hole in the flower pot. Without pulling it all of the way through, put a small dollop of hot glue on the button where it will set against the flower pot and pull it snug. It’s ok if some of the hot glue oozes up through the hole, hopefully it won’t be much, but if you will wait until it dries you can probably peel it off. 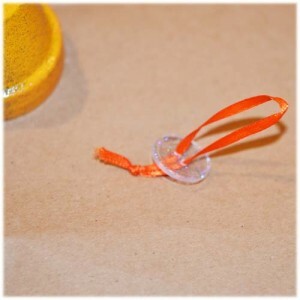 Be careful and try not to get it on the ribbon as it is hard to impossible to get off of the ribbon. This makes a really secure hanger that is unlikely to come off. 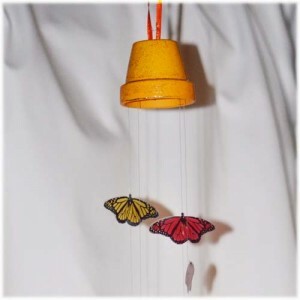 Now you’re ready to attach your butterfly lines (on the monofilament) to the flower pot. The most important things are to put them as evenly spaced as you can so they are less likely to tangle up and not to tangle them up while you’re putting them on. It’s a little difficult but even if they do get tangled you can untangle them with a little patience. 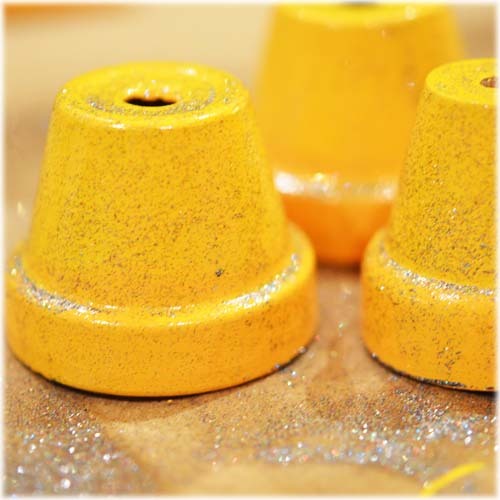 It’s a little difficult to see in the photo, but you simply place the top end of your filament, opposite where the beads are, on the inside of the flower pot, hold it still with one hand and dab some hot glue with the other. 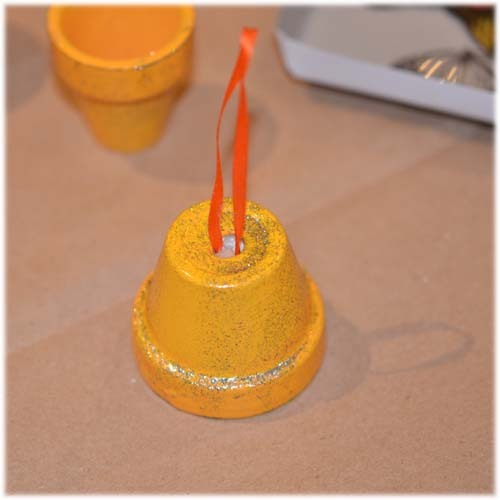 This sounds really simple but of course it can be a little more difficult as the pot tries to roll and the hot glue doesn’t go exactly where you thought you pointed it and the monofilament dances around. Be careful not to touch the end of the hot glue gun because it’s HOT! And of course don’t get the hot glue on your skin because it’s also HOT! Let each one dry before you glue the next one. It doesn’t take long. Also try to get the glue a little way up inside the pot so it doesn’t show. Don’t worry too much about it if it’s difficult. It was impossible with the smaller pots. Then, check the ends where the beads are and trim any excess hot glue that you can, little strings, you probably can’t do anything about globs, but they won’t show much. Also check for hot glue strings elsewhere. I always seem to get them. FINALLY! Find a place where you can hang it and arrange your butterflies to best effect. The nice thing is that you can move them on the filament until you like the arrangement. They should stay put. When you move it the lines will probably tangle but they aren’t that difficult to untangle. Just don’t pull too hard on them. I made these for gifts. I think with help kids could make these for Mother’s Day or Christmas. And it doesn’t have to be butterflies. I’m going to try some other things as well. And as I said I’ll share the other projects in the near future. And as always, if you make something you want to share, please do, I would love to see it! What a super tutorial ! and such a wonderful creation ! 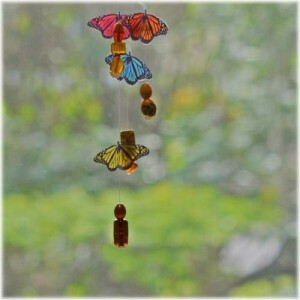 Love butterflies very much ! Susan, I like these a lot. Will definitely be making some. I’m always taking butterfly pictures in my yard so have a ready supply of various kinds. I hope you post a photo when you do! I love butterflies. I have several types common here but some of the most beautiful ones are difficult to get good photos of. This particular one just happened to be very cooperative that day!